Highland Council was under fire last night for spending £500,000 to dress an iconic Inverness building in a “hideous” gold coat. Local authority chiefs insist the move will improve the “appalling” art gallery and museum in the city’s Bridge Street. But several councillors have condemned the expenditure at a time when the council is having to slash its budget by £50million and 400 staff are expected to take voluntary redundancy. 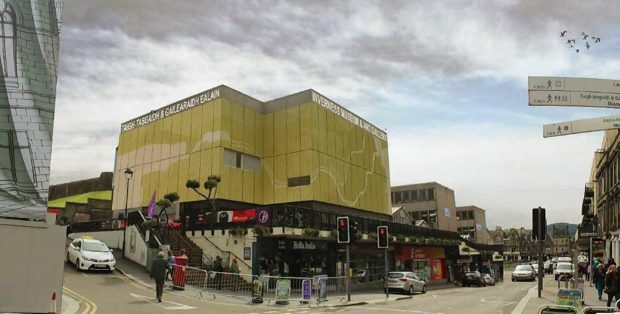 The plan to clad the museum and art gallery in gold coloured aluminium were approved without a vote by the local authority’s south planning committee yesterday. And council leader Margaret Davidson emphasised that the £500,000 installation was being funded by UK Government “City Deal” money already provided. It was not clear last night if it would also fund maintenance and cleaning costs over the expected 10-year life of the cladding. Mrs Davidson said: “We’ve got the first £3million of City Deal money and this is funded out of that. The spruce-up will be a stop-gap while plans take shape for a radical revamp of the adjacent castle complex, which may incorporate a new museum and gallery. Various options have been the focus of a public consultation. “The courts service isn’t moving out of the castle until 2017, so we’ve got some interim years where we’ve got to make the best of the resources we’ve got,” Mrs Davidson added. She said the project would create construction jobs and be a useful investment in infrastructure. The question of cost was not supposed to be part of the debate at the committee, but was raised by several councillors. SNP committee member Bill Lobban was “appalled” by the £500,000 cost of the “hideous” shroud. The Highland Alliance’s Donnie Kerr doubted the project would increase footfall. Independent councillor Jim Crawford sought reassurance that the golden wrap would retain its glow longer than the recently installed “Golden Bridge” over the A9, which he claimed had already lost its sheen. SNP councillor Richard Laird reckoned the cladding would improve “the ugliest and least popular building in the city centre”. Recent complaints about council spending included the £760,000 the council plans to invest in riverside “artworks”, including a tilting pier. If that happens, it will cost the city’s common good fund £280,750 and council coffers £106,000. The rest will come from Creative Scotland and Highlands and Islands Enterprise.